Caldecote A v Shefford T&C A. Picture: David Kay. Flitwick Town remain four points clear at the head of the Premier Division supported by Sportsform after they stretched their winning home ways to four games with a 5-4 victory over Kempston Rovers Development. Will Scutt scored a brace and was joined on the scoresheet by Martin Byrne, Ritchie Bevan and Ian Buckingham to bring up the nap hand against Rovers replies via Sam Smith with a brace plus Patrick Asare and Franck Noah. For second place AFC Oakley M&DH it was a 2-1 home victory over Ampthill Town Reserves, Ali Smith and Rob Heaney netting the vital goals against a lone Town reply from Cameron Edwin. Whilst third place Caldecote had to settle for a share of the points when drawing 3-3 at fourth place Wilstead. Paul Jones with a brace plus Liam Fenton scored for the home side against Caldecote replies via Ossie Smith, Nicky Albone and Tom Wallace. Following two straight defeats, Renhold United returned to winning ways with a 3-2 home victory over AFC Kempston Town & Bedford College. Wes Lewis, Ben Brown and an own goal did the damage against Town replies from Dan Green and Delroy Phillps. Elsewhere, Cranfield United notched up their third home win on the bounce with a 2-1 victory over Shefford Town & Campton. Adam Hulks and Martin Holland scored for United against a lone Town reply from Ryan Lewis. Whilst just down the road it was the same 2-1 scoreline that took Wootton Blue Cross to a home victory over Marston Shelton Rovers. Jack Downes and Rob Odell on the home scoresheet against a Rovers reply via Wes Burrows. Over on The Green there was a 5-1 home win for Ickwell & Old Warden over bottom of the table Sandy. Ashley Boness and Sean Duignan both netted twice alongside a single strike from Zak Rowe to bring up the nap hand against a lone Matt Johnson reply. Whilst Sharnbrook’s four game unbeaten home run was brought to an end by Stevington who beat them 3-0. Lawrence Bentham netting twice and Ben Walsh once. Despite being held to a 2-2 draw at bottom of the table Old Bradwell United Reserves it was an increase up to 10 points at the head of Division One league table for Queens Park Crescents and a retention of their unbeaten away record. Anish Khinda and Daniel Rasol were on their scoresheet against United replies via Joe Canavan and Charlie Wells. Whilst now in second spot are Totternhoe Reserves who likewise had to settle for a 2-2 draw on the road at Henlow. Jonny Clarke with an opening half brace fired the Totts 2-0 ahead before a second period brace from Luke Hills squared matters up only to see leading goalscorer Paul Wright fail to complete the perfect comeback by having his 90th minute penalty saved. Losing out on that second spot, albeit on goal difference are M&DH Clapham Sports who were beaten 5-3 at fourth place Crawley Green Reserves. Adam Marsh with a brace plus goals from Sam Woodham, Callum Beaney and one from the penalty spot by Robert Newman brought up the home nap hand against M& DH replies via Marko Toczic, Ryan Prior and Sam Maddix. For Kempston Town & Bedford College Reserves it was win number five on the bounce when winning 6-1 at second from bottom of the table Elstow Abbey. Kegan Roberts with a brace was joined on the scoresheet by an own goal plus goals for Giovanni Moscaritoio, Jesse Sidhu and Bradley Temperley against the lone Abbey reply from the penalty spot via Dean Leyton. The biggest score of the day went to Shefford Town & Campton Reserves who ran out 10-0 home winners over Meltis Albion. Chris Clark netted four times alongside braces for Josh Lummis and Sam Kelly plus single strikes from Simon Castle and Jordan Greenwood. Whilst Cople & Bedford SA brought their four game losing home run to an end with a 3-1 victory over Westoning. Ollie Hughes netting twice and Dominic Andrews once against a lone reply from Thomas Cooksley. 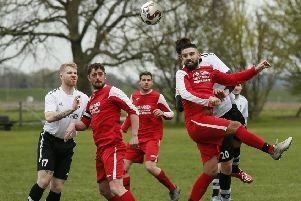 The game of the day in Division Two saw third place Riseley Sports take their unbeaten ways to eight games via a 3-3 home draw with league leaders Atletico Europa. Sam Harrison, Jack Healy and Mitchell Crook were on the home scoresheet against Europa replies via Tedan Jankovic twice and Paddy Aliman once. Whilst it was also stalemate at Mill Lane in the clash between the bottom two sides. Hosts Potton Town led via Jordan Thomas before Rovers Craig Barnes squared matters up to ensure their hosts remain bottom. Elsewhere for fourth place Cranfield United Reserves it was a 2-1 away defeat at Flitwick Town Reserves. David Lyons and Dave Keefe were on the Town scoresheet against a lone United reply via Ben Thompson. Whilst fifth place Lea Sports PSG retained their unbeaten ways with a 3-1 home victory over Caldecote Reserves thanks to goals from Joe Hennem, Rhys Holding and a successful penalty from Ryan Darby. The Caldecote reply being an own goal. Marston Shelton Rovers Reserves find themselves just a point off the top of the table after netting a 5-0 home victory over league leaders Wilstead Reserves. Gary Russon with a brace plus strikes from Keiran Day, Ross Milton and Dean Clark brought up the nap hand. However just a point behind them and having played two games less are now third place Bedford Albion who took their unbeaten ways up to seven games with a 8-0 home win over Sandy Albion. Paul Babbington with a hat-trick, and Jack Brown with a brace were joined on the scoresheet by Michael Michalski, Shane Canzano and Pasquale Grasso. Also still very much in the title race are fifth place Caldecote A who sit just goal difference behind the Albion having played the same number of games after netting a 4-0 home win over Shefford Town & Campton A. Ricky Aris, Tony Norman, Neil Giles and Robert Salvaggio all finding the back of the net to do the damage. Whilst for White Eagles it was a likewise 4-0 home win over bottom of the table Wootton Village thanks to goals from Arkadusz Boruch, Mateusz Dybikowski, Vagile Grosv and Kazimiere Orzechowski. For league leaders CS Rovers it was an end to their 100% away record when they were held to a 3-3 draw at Harlington, Shaun Gentle-King hitting a home hat-trick against Rovers replies via Connor Darocha twice and Jamie Gray. Whilst second place Clifton’s title hopes took a knock when they were beaten 5-1 at home by Henlow Reserves who now sit in third spot and are starting to look like title contenders themselves. James Campbell with a brace plus single strikes from Gareth Brown, James Davis and Robbie Bratchell brought up the winning nap hand against a lone home reply from George McMillan. Elsewhere there was no joy for bottom of the table Lidlington United Sports who fell to their seventh consecutive defeat when beaten 5-2 at AFC Kempston Town & Bedford College A. Mark Allen with a hat-trick plus Daniel Mattin and Gavin Cheema netted for the Town against United replies from Ben Stubley and Tom Staples. The scheduled dead rubber fixture between Sandy Reserves and Kempston Athletic was called off due to the unfit state of the hosts’ Bedford Road pitch. Stevington were to end their series of group games on a high by winning 6-4 at Dinamo Flitwick. Jamie Endersby and Sam Nightingale with braces were joined on the scoresheet by Sam Cody and Regan Scott for the winners against home replies via Dale Goldie twice plus Alex Sommers and Rhys Hughes. In drawing 3-3 at home with Renhold United Reserves it’s a place in the last 16 for Houghton Athletic and a place in the Watson Shield for Renhold United Reserves. Troy Walker with a brace plus Ali Mohaydeen marked the home scoresheet against United replies from Luke Marsh, JP Stribling and Andy Pyke.